Registration from April 24th to September 30th 2014. 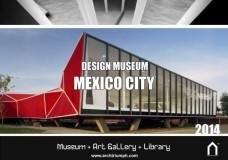 The program for this international ideas competition challenges participants to design a new Contemporary Design Museum to house a collection of contemporary designs by both Mexican and International designers. The proposed Museum's collection will cover an exciting range from product, industrial, graphic, fashion to architectural design. The proposed Museum should explore the role of Museum today and the relevance, expectation and possility for an inspirational space where visitors can comfortably engage with design and architecture through the exhibits and space in itself. The Museum design should apply and encourage the use of ecological and sustainable design principles where possible. Access to the Museum must satisfy disabled access requirement standard.